Christopher Sartisohn is a writer, musician and artist. A graduate of the University of Victoria’s English department, his academic studies have included literature, linguistics, history, psychology, philosophy, music and digital media. Sartisohn's music has been compared to Beck, Radiohead, Hayden, Mugison, Tom Waits, David Bowie, Frank Black, Kurt Cobain, Bob Dylan, Leonard Cohen, Neil Young, Chris Cornell, Frank Zappa, Captain Beefheart, William S. Burroughs, Django Reinhardt and Bireli Lagrene. 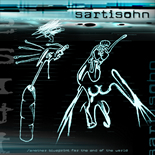 Sartisohn's writing has been compared to the works of William S. Burroughs, James Joyce, T.S. Eliot, Thomas Pynchon, Jorge Luis Borges, Tom Waits, Charles Bukowski, Hunter S. Thompson and Kurt Vonnegut Jr. In 2001 he founded the multimedia development firm Carbonize Hypermedia, encompassing publishing, record label and design divisions. Sartisohn has released over fifteen albums spanning various genres and has authored numerous underground and online literary publications. His debut novel Gargoyle Hotel, book one in the Carbon City trilogy, was published in 2014 by Carbonize Press. He is currently editing The Crimson Lounge, part two in the trilogy, while his book of collected lyrics is pending publication. He divides his time between Victoria, British Columbia and multifarious foreign lands. © Content property of Carbonize Hypermedia. All rights reserved.